Feral Interactive on Tuesday announced the forthcoming release of Lego Batman: The Videogame for the Mac. It’s coming April 9, 2009 and will cost $40. Lego Batman lets you play with and build vehicles and other objects in the world of Batman. Lego Batman: The Videogame follows on Feral’s successful release of Mac versions of Lego Star Wars II: The Original Trilogy and Lego Indiana Jones. 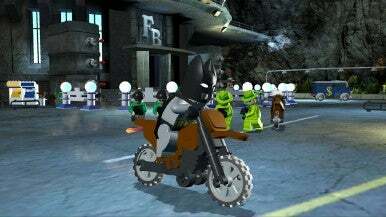 The game combines the characters and setting of DC Comics’ famed Caped Crusader with popular Lego building block toys. Players can assume the role of Batman along with some of his biggest foes, including The Joker and The Penguin, as they escape fro Arkham Asylum. You get to operate Batman’s gadgets and build and operate vehicles as you explore Gotham City, the fictional home of these comic book heroes and villains. Minimum system requirements call for an Intel-based Mac operating at 1.8GHz or faster, 128MB graphics card, DVD-ROM and Mac OS X 10.4.10 or later. Feral advises that Lego Batman runs on an Intel Mac, including all Intel-based Mac minis and MacBooks.